After many translations of Tagore’s songs and poems, I finally realize, it’s not enough that I am a Bengali, and can claim I understand his poems and his songs. There’s something missing in my translation. The fact that I’m not a Philosopher, therefore I am unable to create the philosophic angle of his song lyrics. Today I’ll make an attempt, hoping I truly comprehend what Tagore is telling us. This song is in the form of a dialogue between nature and our feelings. Death says I sail your life boat! 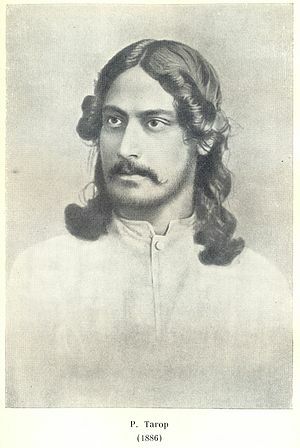 Monihar means a collection of Tagore’s songs. There is a story why Tagore wrote the lyrics of this song. According to another singer, Tagore did not get any recognition for his writings, no one paid attention to him. when he received the Nobel prize for literature, a group of famous authors went to his Shantiniketon school to congratulate him. Tagore was offended by this sudden recognition from the famous Bengalis who had no time for him, who came with garlands to congratulate him, after he got the Nobel Prize. This is when he wrote the lyrics of this song. It pains when I try to tear it. It disturbs me so I cannot pay attention to my work. Only then I will breathe a sigh of relief. And I’m ashamed to show my face! He wrote the lyrics and showed it to his favorite sister-in-law. What is symphony? it’s a pleasing arrangement of colors, and shapes. For the prompt, “Symphony,” I used Tagore’s song and translated it in English. In my mind it has music, and portrays thoughts of the poet. There is rhythm in it and Hemant Kumar’s unusual voice is sweet and pleasing to one’s ears. I have no idea how to quench my day’s thirst and relief of exhaustion from the day’s walk. My heart wants to give, it’s not satisfied with receiving alone. I want to hold it, fill it and keep it with me. It will help my loneliness, o my friend and beloved! We all love the word ‘HOPE’, it is so wonderful to think about it and believe as long as we hope we will be successful in life. Tagore has written many songs and poems titled, ‘Mother.’ It doesn’t always mean his own mother, sometimes he means his country, earth or even God. I have come with a lot of hope, dear mother, please don’t turn me away. No one wants a destitute, I know you will give me shelter. I do not want anything else, I only want to sit beside your feet. If you do not give me shelter where will I roam around crying? There in the distance I see terrible dense cloud this night. Oh Mom I hope you will save me from the perilous storm. I am willing to drown! I write because I enjoy writing. It helps me write about things that is not always possible to carry on in a conversation. I am not sure my friends or relatives would like me to talk in length what my thoughts are, some may show interest only half-heartedly ;others may tune me out; thinking what I’m saying is not interesting enough for them. When I write I please myself, I do not have to think about anyone; it’s just my world and I get the luxury of putting my thoughts in print. Some may read it , others may not. I write because it helps me to express myself. I like to write about myself, who I am, why I’m writing, why do I have a blog. I have made friends through my writing. Blogging has helped me write about things I would not otherwise write. I’m glad I decided to translate some of Tagore’s poems and his songs. I feel it is interesting for people who’ve heard about him, but are unable to know about his writings because of the language barrier. In a very small way I’ve tried to post some of his writing by translating them. What’s the better idea you’ve ever had? Regale us every detail of the idea_ the idea itself,where it came to you, and the problem it solved. The best idea I ever had was when my friend Robert started blogging, and I wanted to find out what blogging was and could I try it as well. I asked my good friend, he encouraged me and said, he was thinking of telling me to pick up the craft of blogging. In the beginning there were a few roadblocks I had to deal with. For instance what can I write about, another friend stepped in and suggested it would be a neat idea if I translated Tagore’s poems. I was thrilled but had to tread cautiously. Yes I knew the language as it happened to be my mother tongue, there was a ‘but’ factor lingering in my brain. Was I capable of taking a risk like that. I did not admit I was scared, at heart I was. This task was not easy, I had no experience translating. I started with a short one and slowly I was feeling confident. I translated several poems and my friend encouraged me all along. From time to time I found other things to do. I discovered the every day daily post. I read the prompts and began to write. From prompts I went to five sentence fiction writing. Each week we were given a one word prompt, we were expected to write a story based on the prompt.I wrote stories for a while. It was discontinued. I looked for other things to do. I joined the 101 writing course offered by WordPress. It lasted for four weeks. I loved it, I was able to keep myself busy. The recent poetry course offered by WordPress was one I loved the most. I loved to read, recite memorize poetry, I did not have the experience of writing it. I’m glad I joined blogging , I’m gaining experience writing things I haven’t done before. Assignment: Feature a guest or Round up of great reads. I included a song in the end hoping after all the serious reads this song by Tagore and translated by me will help you relax while you listen to the lyrics of our great poet and philosopher, Tagore. Write today’s post on ideas from your list. If you don’t have any ideas to choose from , not to worry. Here are four passages you can choose from to get you going. I love music always did from my childhood. I used to sit in a corner of our house, which was always vacant, it gave me an opportunity to sing songs I learned in school. Once I went with my older sister to her colleagues house. She didn’t know how to entertain a quiet teenager like me . She quickly got her record player and Played a song by Tagore. I fell in love with that song and listened to it thirteen times. After the thirteenth time I did not ask to continue listening, I thought she might feel I am weird. I loved the lyrics of the song, Tagore was a magician when it came to writing lyrics. Since it is in Bengali my mother tongue. I will translate it into English. before this happens, I will take care of my buying and selling and will pay my dues. Do not look up at the stars and call me. You will feel my absence when you look at my things. I do not expect you to remember me at that time or call me. The cattle will graze, life will go on as usual. Do not remember me or call me then. Then one bright morning who can say I won’t be there? I will take part in the games as before only I will have a new identity. I will go on forever! Day Five: Make the Most of Your Archives. Today’s assignment: Integrate a feature to draw traffic to your older content like a widget,related posts, or a “Best of “Page. In his lifetime Tagore wrote in all sorts of literary forms. Despite that, the name of poet stuck to him. He was called viswa-kabi(the universal poet) by his own people. He was certainly one who wrote variety of poems.When one surveys his poems, one could exclaim as Dryden did about Chaucer,’Here is God’s plenty.’He began writing poems at a tender age. It is said that when he lay dying,poems kept coming to him. Although he was incapable of writing himself,he dictated the poems,he checked them to be sure they were formed perfectly. 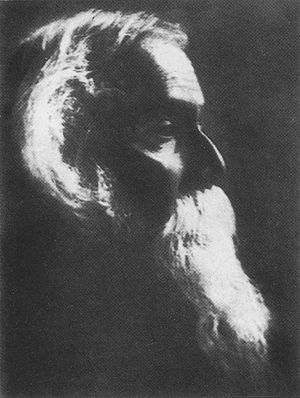 I have read many poems of Tagore.I never thought of translating them.To me they were there to read and enjoy.The feeling that I should translate them to show the beauty of his work,came to me only lately.In English there are limited words one can use to translate Bengali prose,poetry or songs. I am aware,my translation will fail to catch the depth of Tagore’s poetry. I have finally found a poem,Tagore wrote,The title is “To Remember”. I do not have any recollection of my mother. as if the sound mixes with my mother’s words in the middle of my game. Did my mother sing while rocking my swing–. My mother has gone but, as she was going she left the song. The smell of Pooja transformed into my mother’s smell and came to me. that is the look she left all over the sky as a reminder for me. 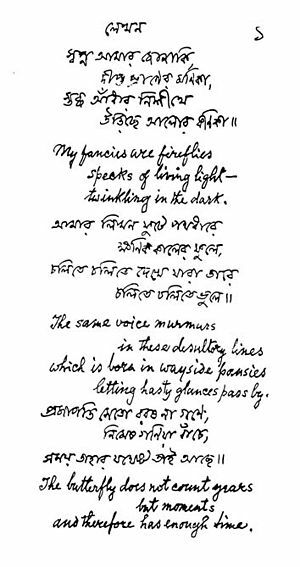 I have tried to translate the Bengali poem written by Tagore into English. I hope it is okay! I cannot be a good judge since I do not know Bengali language, but I thoroughly enjoyed your English translation. To me the best part about it was that it gave that feeling of being overwhelmed, almost like being pulled into an ocean of emotions forcefully and suddenly – which I have understood to be a hallmark of Tagore’s poetry, and a kind of his “signature” (by which I mean, what makes him different from other poets and comes out even in translations, when translations are good). Thank you Bhai,I was afraid to translate it,I felt I know the language,maybe I should give it a try. The exceptional comment coming from you,certainly made my day.Whichever way I say thank you isn’t enough. When Akhtar Bhai suggested to write about Tagore especially his poetry.I was a bit scared,I was not sure how to handle it. At the same time I did not want to admit I couldn’t do it.Many many thanks once again! This is an absolutely beautiful poem. I like that Tagore is referred to as the Universal Poet. It seems right that God would have His poets. Thank you very much for this, the poem has an enormous effect on heart and mind, and also creates a splendorous sensibility about the relationship that the poet describe so simply but that simplicity produces a river of opus that flows in imagination as musical notation.